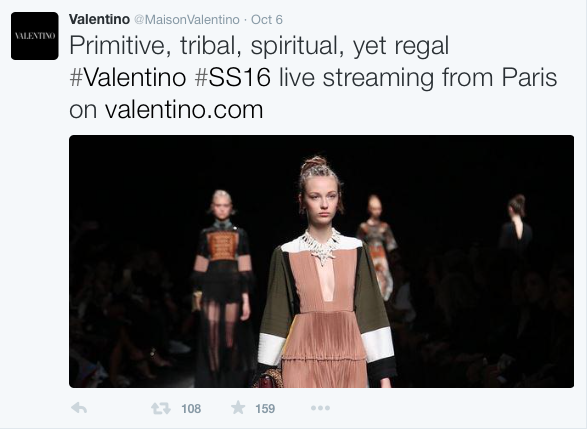 Valentino’s Spring/Summer 2016 collection is out and it just put “wild Africa” back on the radar of mainstream fashion for a controversial reception. 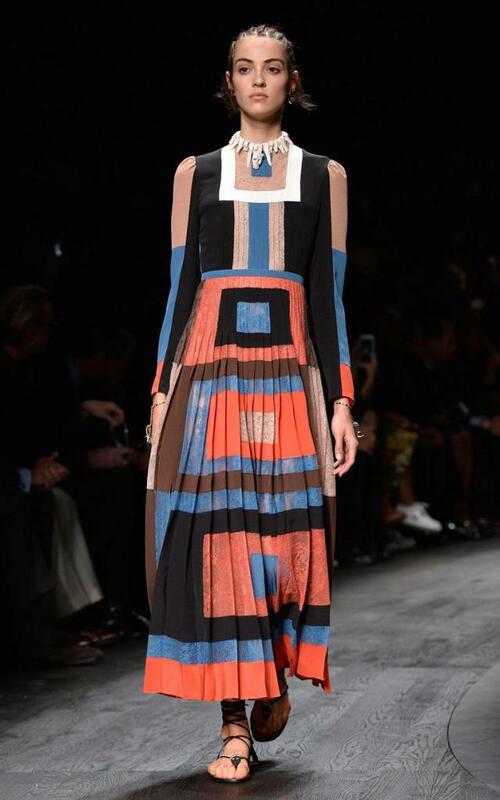 Described as “an ode” to the continent, the collections was designed by Maria Grazia Chiuri and Pierpaolo Piccioli to channel the “regal” allure of the “primitive, the tribal, the spiritual.” To this aim, it showcased kaftans, smock dresses, flares, and tunics in geometric prints and colorful embroideries to a soundtrack of bongo-drumming. 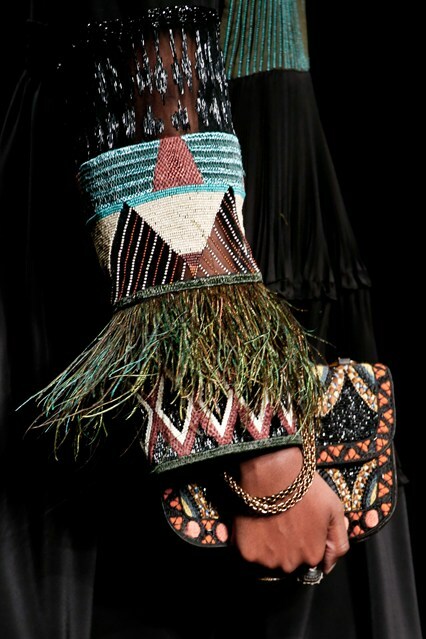 The caucasian models wore their hair in cornrows and carried an array of African-inspired accessories that included bone necklaces, feathers, bags decorated with Masai beads, horsehair cuffs, metal masks. 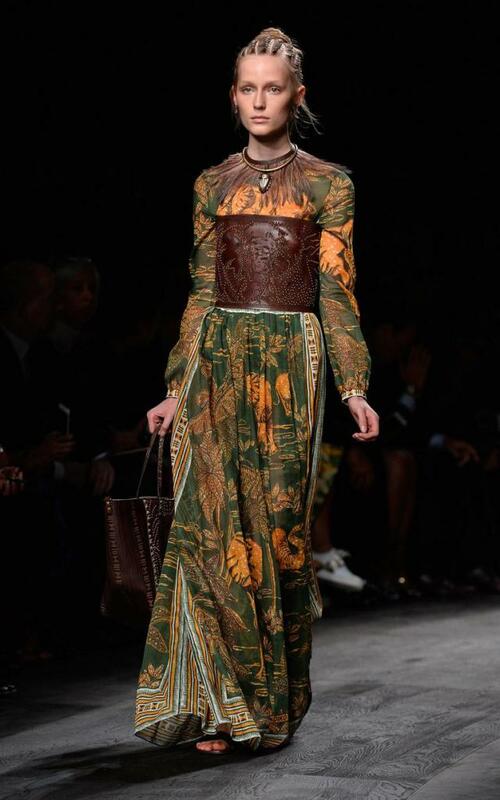 Some garments had raffia fringing and bands of decorated suede. Although Vogue UK and other prominent voices of the fashion world judged it “an epic body of work”, the show sparked an online controversy. 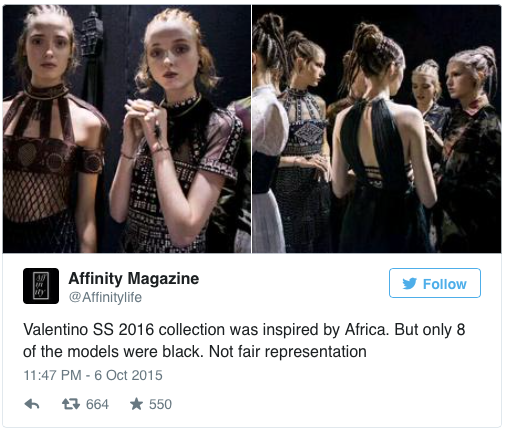 Users took to Twitter to accuse Valentino and his team of cultural appropriation and stereotyping the continent in the service of a predominantly white audience. 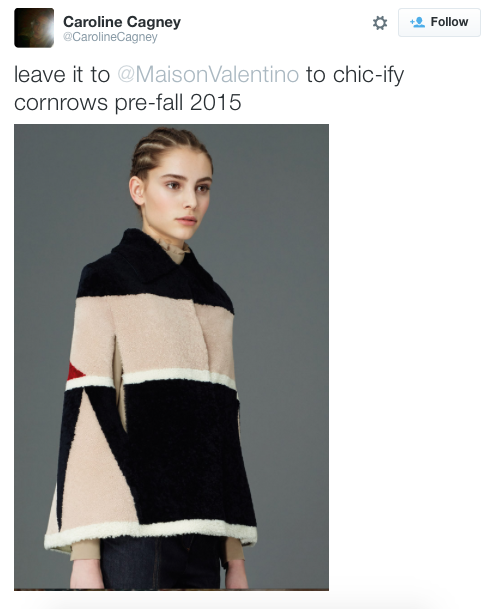 This critique goes back at least a year, when Valentino’s pre-fall 2015 collection also featured white models sporting cornrows and extends beyond the realm of haute couture (let’s not forget Rachel Dozel’s hair politics). Here, as in countless other recent examples of cultural appropriation by white celebrities, stylistic markers become mere accessories that reinforce a pre-determined “economy of images… disconnected from the historical context from which [they] arose” (Davis 1994: 38). 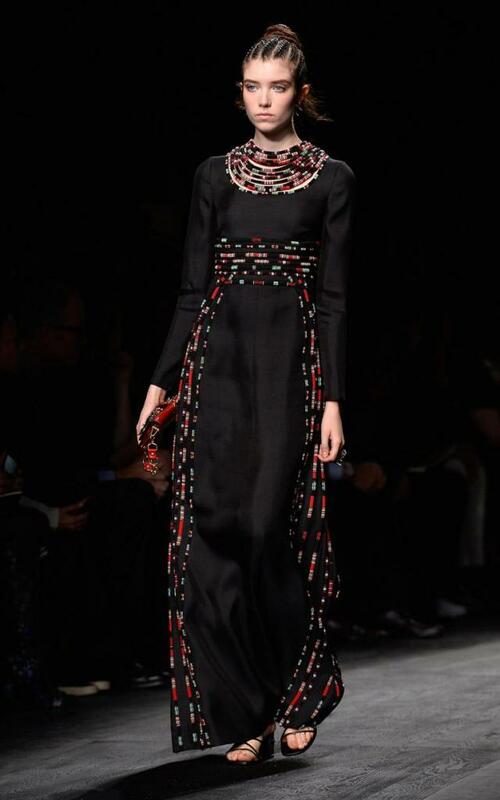 Actually, Valentino’s collection is a textbook example of fashion’s long history of glamorizing the exotic. Victoria Rovine writes about the consistent presence of “African-esque fashion” on European runaways in African Fashion, Global Style (2015, Kindle edition), noting that dress has contributed to create “interactions between Western and non-Western cultures” that influence how we imagine and image Africa (unpaginated). Since colonial times, the “African” in European fashion has “reflect[ed] and actively shap[ed] the perceptions – and misperceptions – […] of Africa in international contexts” (id.). Further, these styles have always acted as “cultural barometers” that measure our level of progress in relation to places and cultures that are perceived as backward. For example, in colonial times, the French imported and “domesticated” styles from West Africa to provide the populace with a material representation of the civilizing mission (id.). 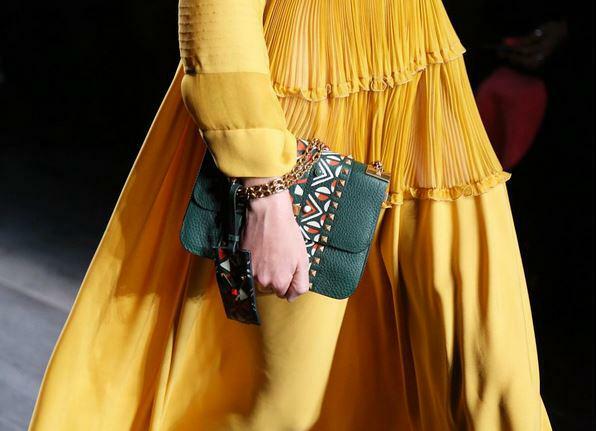 Just like in Valentino’s new collection, Rovine observes that the African influence in French fashion in the 1930s, “was most readily apparent in instances of stylistic or iconographic adaptations, in which French designers incorporated recognizably African forms and imagery into their garments. In some cases, designers drew directly from aspects of African dress, adapting textiles, patterns, and garment types. […] Prominent among the iconographic references to France’s non-Western colonies […] were elephants, palm trees, animal prints, and representations of African sculpture” (id., my italics). Referring to more recent trends, specifically those of the 1990s and 2000s, Kristyne Loughran (2009) also points to the exotic allure of a certain “idea of Africa” that builds upon notable precedents like Yves Saint Laurent’s 1967 “Bambara” dresses. In 2005, Gaultier created another African-inspired collection that included an ostrich-featured dress and another made of bronze beads. Yet again, on that occasion hairstyling was an essential element of the exotic display with (white) models attacking the catwalk on gravity-defying afros. Including an analysis of some successful African designers in Paris like Xuly Bet and Alphadi which draw from stereotypical African markers, Loughran shows that the allure of the exotic can work both ways and actually help to foster a “global dialogue” (244). Davis, A. (1994), ‘Afro Images: Politics, Fashion, and Nostalgia’, Critical Inquiry 21(1): 37-45. Loughran, K. (2009), ‘The idea of Africa in European High Fashion: Global Dialogues’, Fashion Theory 13(2): 243-272. Rovine, L. (2015), African Fashion Global Style: Histories, Innovations, and Ideas You Can Wear. Bloomington: Indiana University Press.